Our faces are very important to us. For better or worse, it’s often the first thing we are judged on. To that end, when something goes wrong with your face—even if it is something small—there’s a good chance that you will worry about the issue until it is cleared up. Take the fact that you can develop calcium deposits on your face. Also known as calcinosis cutis, these deposits can be quite troubling. Luckily, there are things you can do about them, and we are here to help. We’re going to share with you what causes calcium deposits on the face, symptoms of calcium deposits on the face, how to get rid of calcium deposits on the face, and any home remedies that may be able to help out. The calcium deposits on the face are deposits that develop underneath the skin. These deposits can form deep within tissues like muscle tissue and even organs. There are four different types of calcium deposits in the face. This is the most common type of calcium deposits on the face. Patients with this form of deposits have often recently been hospitalized. Cases of idiopathic calcinosis aren’t commonly linked to recent illness or injury. These particular calcium deposits generally start on one part of the body and then spread to other places. What distinguishes these different types of calcium deposits in the face is the fact that each is associated with a unique cause. What Causes Calcium Deposits on the Face? Parathyroid glands regulate the metabolism of calcium within the body. Over-stimulation of these glands can lead to higher levels of calcium in the blood. Consuming vitamin D, calcium, or magnesium supplements in excess may create a higher risk of calcium deposits in the face. This disorder is characterized by the unusual breakdown of bone tissue, but it can also increase the chances of calcium deposit growths on the face. Now that we’ve discussed the causes, we can move on to the symptoms that can help identify the calcium deposits. Not surprisingly, the most obvious symptom of calcium deposits on the face is the presence of calcium deposits on the face. These growths usually appear slowly and grow over time. These deposits are fairly recognizable and do have various symptoms and characteristics. The calcium deposits appear as white to yellow pimples, patches, or nodules. They are firm due to calcium tending to form a hard mass. The deposits can be tender, and can sometimes be painful on sensitive parts of the body like the fingertips and face. The ulceration of the deposits tends to produce pain as well. They may secrete or ooze a cream-colored discharge. If the deposits spread to the joints, the joints can become stiff. Finally, the skin around the deposits may turn gangrenous. The big question of this entire article is how to get rid of calcium deposits. Luckily, there are many treatment options—both medical treatments and home remedies—that can help ease or get rid of these calcium deposits on the face. You can make a face pack from fruit peels (from low-strength fruit acid) that can be effective in exfoliating the skin above the swelling. These packs can help get rid of calcium deposits. 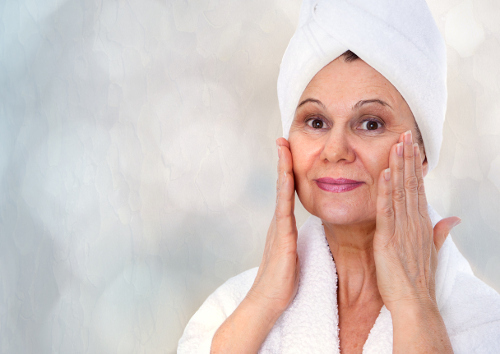 The regular application of retinoid cream can help get rid of dead skin cells. As new skin cells replace dead skin cells, deposits of calcium are also removed. Surgery can be performed when medications fail, but is only used as a last result as surgery can cause more calcium deposits to spring up. While it can’t help get rid of a calcium deposit, an ice pack can help with the pain that the deposits may cause. Wrap an ice pack in a towel and place it on the deposit for a few minutes. This can provide some temporary relief from the pain. Calcium deposits in your face can be unsightly and painful. The minute you see one, you will want it gone. Fortunately, while it may take some time, you can get rid of a calcium deposit on your face with some medications, home remedies, and a bit of patience. If those don’t work, there is always the possibility of surgery. Make sure to consult your doctor if you see a calcium deposit, to determine which treatment is the right one for you. Salina, “How To Get Rid Of Calcium Deposits On Face? What Are Its Causes?” Simple Remedies, January 11, 2013, http://www.simple-remedies.com/home-remedies/calcium-deposits-on-face-causes.html, last accessed June 6, 2017. “Causes and How To Get Rid Of Calcium Deposits On Face,” Geek Loves Health, July 20, 2015, http://www.geekloveshealth.com/causes-and-how-to-get-rid-of-calcium-deposits-on-face/, last accessed June 6, 2017. “Calcium Deposits On Face – The 5 Main Causes,” Wealth For My Health, https://wealthformyhealth.com/calcium-deposits-on-face/, last accessed June 6, 2017. “How To Get Rid Of Calcium Deposits On Face? What Are Its Causes?” Tandurust, December 7, 2012, http://www.tandurust.com/skincare/calcium-deposits-on-face-causes.html, last accessed June 6, 2016.